Curly hair tips. Reflections of You Salons Northern Va. Anyone with curly hair has heard at least one person with straight strands lament, “Your hair is so pretty, I wish I had curly hair!” It’s meant to be a compliment, but having a good curly hair day is harder than it looks. Good news is you’re in the right place to get your easiest, healthiest hair routine ever. First, these simple tips will keep waves and curls looking shiny and strong. Then, advance to eight easy hairstyles you can whip out before the morning coffee’s ready. 3. Use product “cocktailing” to customize your haircare regimen. “Product cocktailing is simply mixing two or more products together to meet your specific styling needs,” explains hairstylist Andrita Renee. Our favorite cocktails: Integrity Haircare Products Exclusive at Reflections of You Salons. Anti Frizz plus mousse, and or Flex gel Plus Curl lift and scrunching foam. Both allow for supreme hold without leaving your hair dry and crunchy. 4. …or try a serum! If you don’t have the patience for cocktailing, your best bet is a serum, which helps to not only smooth your curls but gives them definition and separation. “Use three or four pumps at a time. Emulsify the product in your hands and gently take it through your curls,” advises New York City-based hairstylist and colorist Patrick Kyle. When your hair goes through a dry or dull phase, what you don’t want to do is weigh it down with a ton of product. Simply use your fingertips to apply a dime-size blob of styling cream or oil to your ends, giving them extra moisture and bounce. 7. Use the “pineapple trick” to get defined curls overnight. Pineappling is a technique in which the hair is loosely gathered at the highest point of the head, usually before sleep. This protects the curl pattern while helping your hair maintain natural volume. Simply take it out when you’re ready to wear it down. If you’re not using the attachments that come with your hairdryer, you’re missing out. 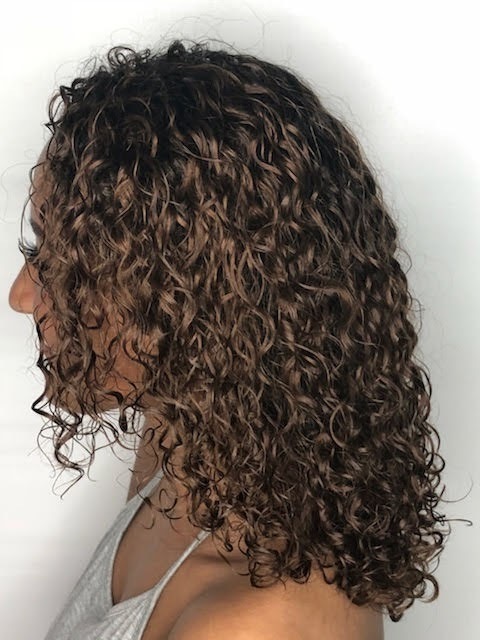 “A diffuser is a blowdryer attachment that minimizes a lot of the frizz that comes when curly hair is naturally air dried,” explains stylist Britt White. Plus, it can help even out your curl pattern and boost heavy curls’ volume. To use your diffuser, first squeeze out the extra moisture in your hair after showering. If your hair is dry, spritz water onto it, then apply a mousse that contains heat protectant. Using your fingers, twirl each curl into the desired shape, then plop your strands into the diffuser, cupping it around your hair. Repeat until you’ve got defined curls all over.